Karen Keifer-Boyd, Ph.D., professor of art education and women's, gender, and sexuality studies at The Pennsylvania State University, USA, has co-authored Including Difference (NAEA, 2013), InCITE, InSIGHT, InSITE (NAEA, 2008), Engaging Visual Culture (Davis, 2007), co-edited Real-World Readings in Art Education: Things Your Professors Never Told You (Falmer, 2000), and served as editor of the Journal of Social Theory in Art Education and guest editor for Visual Arts Research. In 2005, she co-founded and serves as editor of the journal, Visual Culture & Gender. Her writings on feminist pedagogy, visual culture, inclusion, cyberart activism, transcultural dialogues, action research, social justice arts-based research, transdisciplinary creativity, and identity are in more than 50 peer-reviewed research publications, and translated into several languages. She has been honored with leadership and teaching awards including a 2012 Fulbright Award as Distinguished Chair of Gender Studies at Alpen-Adria-Universität Klagenfurt in Austria, and a 2006 Fulbright Lecture and Research Award in Finland--both from the Council for International Exchange of Scholars; the National Art Education Association (NAEA) Art Education & Technology Outstanding Research Award (2015), Distinguished Fellow Class of 2013, Edwin Ziegfeld Award (2013), Women's Caucus Connors Teaching Award (2005); the Texas Outstanding Art Educator in Higher Education Award (2001); and the Arts Administrator of the Year National Art Education Association Award for the Pacific Region (1994). She served as president of the NAEA Women's Caucus from 2010-2012, and is the coordinator of Curricular Encounters with Holocaust Heroes: Fierce Females—Tapestries & Sculpture by Linda Stein and the Judy Chicago Art Education Collection. 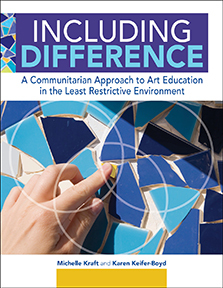 Including Difference is dedicated to art educators who endeavor to create participatory, inclusive classroom communities for learners of all abilities. Chapter 1 provides the legal landscape of special education law to harvest for creating an inclusive art education environment. Chapter 2 examines empowerment through difference, exploring the value of diversity, stereotypes associated with disabilities that are often advanced through visual culture imagery, and art education approaches for reclaiming what “disability” means. Chapter 3 concludes Part I as further preparation for maximizing inclusive experiences for all learners by providing guidance on how to work collaboratively with stakeholders (i.e., parents, art educators, students, special educators, instructional aides, etc.) and by offering inclusion strategies that utilize adaptive technologies, and knowledge of diversity from specific case studies. The second section of the book, “Human Empowerment through the Arts (HEARTS): A Model for an Inclusive Class” beginning with Chapter 4, presents one model for a pre-service art education course in teaching in the inclusive art class as example of communitarian theory in practice. In Chapter 5, we challenge standardized assessment techniques as ineffective for an authentic understanding of student learning in the inclusive, diverse communitarian art class. Chapter 6 draws on previous chapters to highlight how to break through barriers that hinder an inclusive art learning environment. Trauth, E., Keifer-Boyd, K, & Trauth, S. (2016). iDream: Addressing the gender inbalance in STEM through research informed theatre for social change. The Journal of American Drama and Theatre, 28(2), 1-17. Keifer-Boyd, K., Knight, W. B., Knochel, A., Liao, C., Meier, M. E., Patton, R., Shin, R., & Sweeny, R. (2014). Moving Mountains: Distributed leadership and cyberformance. In D. J. Hickey & J. Essid (Eds. ), Identity and leadership in virtual communities: Establishing credibitily and influence (pp. 107-120). IGI Global. Kabiito, R., Liao, C., Motter, J., & Keifer-Boyd, K. (2014). Transcultural dialogue mashup. The Journal of Interactive Technology and Pedagogy, 6. Book chapters cited below are linked at kunstuniversitätlinz. Keifer-Boyd, K. (2010). Masquerading the immateriality of materiality. In R. W. Sweeny (Ed. ), Inter/sections/Inter/actions: Art Education in a Digital Visual Culture (pp. 170-181). Reston, VA: The National Art Education Association. © . Used with permission of the National Art Education Association. Keifer-Boyd, K. (2009). CyberNet activist art pedagogy. In A. Arnold, A. Kuo, E. Delacruz & M. Parsons (Eds. ), G.L.O.B.A.L.I.Z.A.T.I.O.N, Art, and Education (pp. 126-134). Reston, VA: The National Art Education Association. © . Used with permission of the National Art Education Association.